I'm still pinching myself only days out from possibly the biggest evening of my life thus far. It is not everyday one gets selected to exhibit in the annual Objectspace Best in Show Exhibition, in fact it's more like a once in a lifetime opportunity and that is exactly what has happened to me. Myself and 18 other talented graduates from design and arts degrees from across the nation have been hand picked by the curators of Objectspace to partake in the highly coveted Best in Show 2013 Exhibition: Open to the public: Opening night Friday 1st February 6-8pm, officially open from 2nd February - 2nd March. 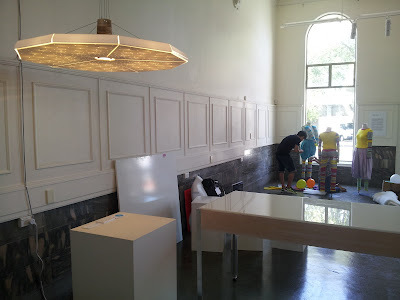 I spent much of yesterday installing LightSpace down at Objectspace and had the chance to meet several of the other exhibitors, who shared with me some of their work. To say that I am grateful and excited is an understatement. I am truly honoured to be participating in a show alongside such incredible talent and I can easily say that this is going to be one of the most wonderful, eclectic, inspiring and creative shows this year, so don't miss it! 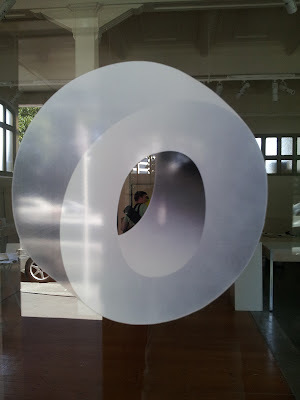 Objectspace putting the O in "Orsome!" Best in Show is an important ongoing Objectspace project that showcases outstanding new applied arts graduates from tertiary institutions around New Zealand. Best in Show 2012 is the eighth exhibition in this series, and features 18 emerging practitioners on the cusp of exciting creative careers. 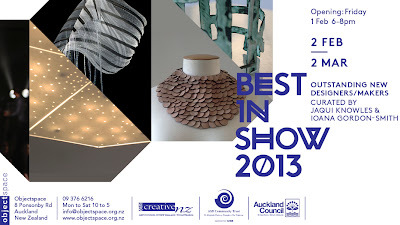 Areas of practice in Best in Show 2012 include graphic design, ceramics, product design, textiles, video art, contemporary jewellery and furniture. The works of these bachelor-level graduates consistently display a level of polish. These works entail few compromises when it comes to materials, aesthetic decisions and other artistic concerns as they engage, spark curiosity or even surprise the viewer. As well as offering the opportunity of what is for many their first public gallery exhibition following soon after their end of year graduate showcase exhibitions, Best in Show 2012 provides a valuable professional development opportunity for these young makers, and an exhilarating exhibition of fresh new talent for the public to enjoy. Best in Show can be a launching pad for outstanding new makers and designers. Objectspace is delighted that a number of previous Best in Showexhibitors have gone on to achieve national and international success. On show simultaneously in the Window Gallery is Talente: One Year On which presents the new work of five exhibitors invited to attend Talente 2011 in Munich, Germany, most of whom have also been Best in Show exhibitors. A big thank you to Jaqui Knowles, Ioana Gordon-Smith and the rest of the team at Objectspace for this incredible opportunity!